The exhilarating conclusion of #1 New York Times bestselling author John Jakes' epic North and South Trilogy—the Civil War saga that inspired the classic television miniseries North and South—with over five million copies sold! The Civil War has ended, but the Hazards and Mains have yet to face their greatest struggles. Even as the embers of old hatreds continue to burn in the heart of a nation torn apart by war, a new future in the West awaits a new generation of Americans seeking a life of their own—and a place to call home. 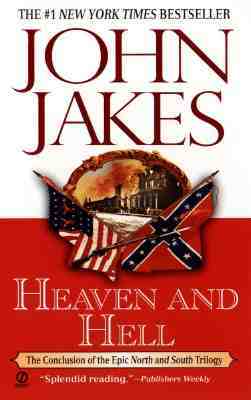 Filled with all of the vivid drama, passion, and action that has made John Jakes the acclaimed master of historical fiction, Heaven and Hell is the tumultuous final chapter in one of the greatest epics of our time.